Development of new sensors and digital processors has provided opportunity for identification of nonlinear systems. Vibration measurements have become standard for predicting and monitoring machinery in industry. 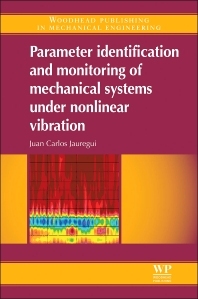 Parameter Identification and Monitoring of Mechanical Systems under Nonlinear Vibration focusses on methods for the identification of nonlinearities in mechanical systems, giving description and examples of practical application. Chapters cover nonlinear dynamics; nonlinear vibrations; signal processing; parameter identification; application of signal processing to mechanical systems; practical experience and industrial applications; and synchronization of nonlinear systems. Juan Carlos Jauregui works at CIATEQ, Advance Technology Centre, in Mexico City, Mexico. He is responsible for the design of automatic, tailor-made machines, installed in various industries. Carlos was responsible for design and construction of a parallel robot for positioning the secondary mirror of the Large Milimetric Telescope, and became Chief Engineer of the Large Milimeter Telescope. He has written more than 50 papers in international journals.